The DSR 500 CP 4000 Plus Rheometer is a flexible cone-plate rheometer that offers the same features as the RM 200 CP 4000 Plus Rheometer - integrated temperature probe, temperature control, and programming and saving multi-step tests and flow curves directly on the instrument - with the additional ability to direct curves and control shear stress. It features automatic raising and lowering of the instrument so that you can lower the spindle precisely to the same point every time. Like all CP instruments, you can choose between one of two options for easy spindle connection. 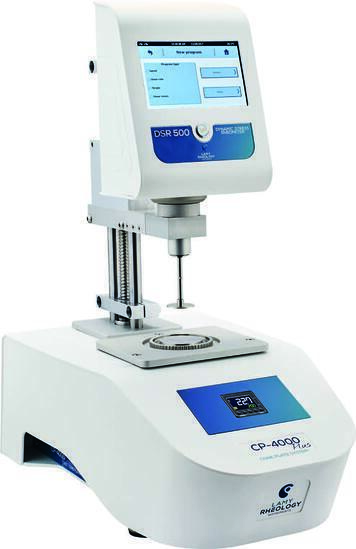 Creams, soft gels, and pastes: DSR 500 CP 4000 + MK-CP 4020 spindle. Optional Rheotex software for computer control. Melt, highly viscous samples DSR 500 PLUS CP 4000H + cone and plate + optional Rheotex Software.